Trinea Gonczar is a fighter. She has experienced significant pain and heartbreak in the past year as she realized she, too, was one of the hundreds of women abused by Larry Nassar. In January of 2018, Trinea was part of an historical display of courage when she and over 100 other women provided victim impact statements during Larry Nassar’s sentencing hearing, when the USA Gymnastics team doctor was convicted of sexual abuse. While coming forward as a victim of abuse is never an easy, straightforward task, their experience was made all the more difficult, as they were also taking on large institutions that systemically failed to protect athletes. 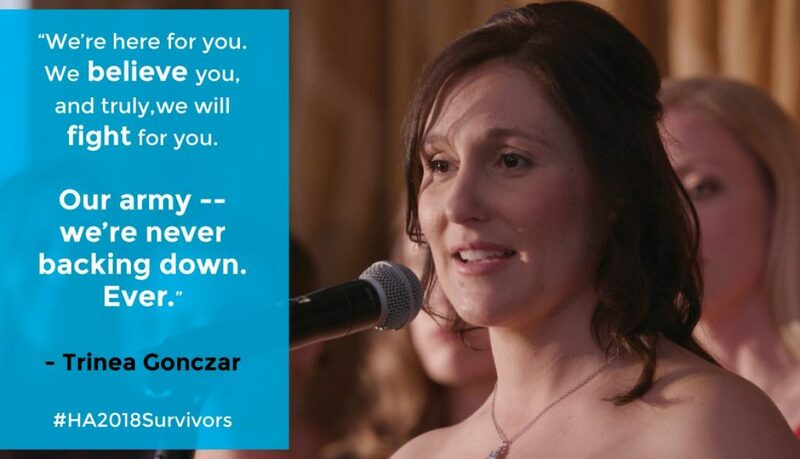 This group of women – now known as the Sister Survivors — have endured incredible challenges along the way. However, they have remained united and strong in the face of significant adversity. They are working hard to change policies, laws, and culture. In the past few months, Trinea has shifted her career to focus on sexual assault prevention and advocacy. In our interview with Trinea, she talks a bit about the trial, her advocacy work, and how parents and adults can take an active role in ending abuse in sport. The news of the Russian track and field doping scandal is everywhere right now, following a report by the World Anti-Doping Agency (WADA) which spotlights serious doping infractions by Russian athletes and officials. Athletes in the United States sent an official letter to the International Olympic Committee (IOC) and WADA, calling on the groups to expand the investigation into other sports. As the IOC, WADA, and athletes around the world seek answers and resolutions and continue the fight to eliminate doping from sport, one has to wonder how a doping culture of this magnitude can develop in a country. In The SI Vault Podcast’s recent episode, “The Doping Addiction,” producer Harry Swartout delves into this very topic. The podcast features interviews with former athletes, officials, and experts in the field, including GSD executive board member, Dr. Steven Ungerleider. Dr. Ungerleider’s extensive study of the East German doping scandal shines a light on the depth of this doping culture, the politics involved, and how a scandal from so long ago is still affecting sports today.